On the Togian Islands, a small Indonesian archipelago in the Gulf of Tomini, the climate is tropical, hot all year round, with a relatively dry season from July to September. 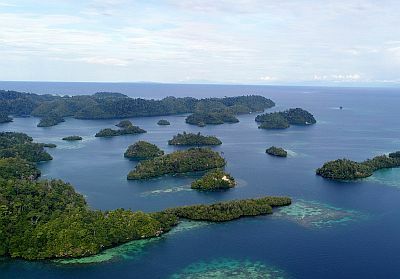 The main islands are Batudaka, Togean and Talatakoh; then there are islands such as Unauna (where there is a small volcano, Colo), Waleakodi, Waleabahi, Dolong and Puah, plus several islets. Temperatures are high and uniform throughout the year. They are slightly higher in April and May and from September to November, and a bit lower in July and August. Here are the average temperatures of the town of Gorontalo, starting point to reach the islands, together with Ampana. The rains are not very abundant, since we are in a fairly sheltered area, although they are quite well distributed throughout the year, in fact the landscape is lush. Anyway, there is the northeast monsoon from November to March, which particularly affects the north slope of Sulawesi, i.e. the coast of the Celebes Sea, while it is not very effective on the south side and in the Gulf of Tomini, and the southeast monsoon from June to September, which is usually quite dry, however, it can bring some rain especially at the beginning of the period (June), and a bit of wind especially on the southern slopes (see Luwuk). Then there is a certain increase in rainfall due to the two zenith passages of the sun, from April to June and in October and November. Furthermore, the rains may increase in the years of La Niña. Here is the average rainfall in Gorontalo. The amount of sunshine on the Togian Islands is not very good, nor scarce: it does not vary much during the year, and remains decent even in the wettest months. Being at the Equator, the Togian islands are sheltered from tropical cyclones. The sea on the Togian Islands is warm enough to swim in throughout the year. The best time to travel to the Togian Islands and enjoy their beaches goes from July to September, since it is normally the driest of the year. All year round, light clothes of natural fibers, a sun hat, a scarf for the breeze, a light sweatshirt for the evening.